With the recent tragedies of retired football players, like Junior Seau, taking their lives after retirement people have become curious on the impact of concussions. In explosive sports such as football, high impact collisions are very common. A study was done on Ray Lewis, one of the most feared hitters to ever play the game. Ray Lewis generates enough force in one of hits that he could break bones every time he hit, if it were not for the protective equipment worn by players. To put it into perspective, it takes 100 g’s of force to cause a concussion; an extreme football hit generates 150 g’s of force. Scary right? Obviously not every hit is going to generate 150 g’s of force, but imagine consistently getting your “bell rung”; it all adds up eventually. Who knows how many concussions football players suffered in the past and the permanent brain damage that resulted from them. Diagnosing concussions and assessing damage caused is very tricky. 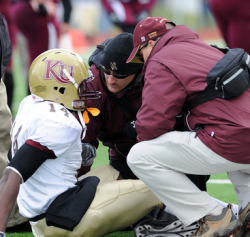 Recently, the Sports Concussion Assessment Tool 2 has become popular in practice. It is very good at diagnosing concussions as the assessment is very thorough. It provides a pretty good gauge on how severe a concussion is, but it is hard to be completely certain on severity. In sports like ice hockey and football where athletes take pride in being “tough”, many times they do not report any symptoms just so they can get back on the field or ice. This alone is a very big obstacle for sports doctors, as successive concussions can amplify the damage caused extremely. Thankfully, many doctors have become more vigilant in their observations and catch a lot more concussions as they happen. There are now mandates that are in place to protect athletes and their brains, as team doctors have the final say on whether they can return or not. Being a Canadian, I pay a lot of attention to hockey. A few years ago, Eric Lindros, a highly touted prospect in the 90’s came out and discussed his life after suffering severe concussions that unfortunately abruptly ended his career. Although it is a lengthy read, it gives us insight on what these athletes experience post-concussion. From anxiety to depression and suicidal thoughts, you never know what someone may be dealing with. Due to the nature of sports (mainly football), players have become faster, stronger, and more explosive. This is leading to huge football collisions that can cause brain trauma. Although helmets and protective equipment are progressively getting better, consistent blows to the head can cause trauma. Even if the blows become lower in impact, they can cause concussions if they are concentrated in the right spots. Thankfully, sports leagues are beginning to focus on concussion prevention with much more urgency. Although not perfect, many companies have now began to try and quantify sports. Technology has been developed that puts numbers to movements during activity. The NFL’s official helmet brand, Riddell, has a helmet called the “insite in development. This helmet sends information to coaches when their players suffer a headshot on the strength of impact and risk of concussion. As a result, a combination of technology and diligence of training staff and coaches can help protect athletes from suffering head trauma, especially in a sport like football, where injuries are seen as weaknesses in the athletes’ eyes. No one wants to see the elimination of hitting in sports such as hockey and football, so it is up to the player safety committees to educate and protect their athletes, so they can live a happy, regular life after retiring from sport.